So said my niece Alice as we were planting a tree in memory of her cousin, Finley. Now I’m not one to argue with a 4 year-old with a romantic streak, but I’d put it differently, if more prosaically: where there is dirt there is life. No dirt, no plants, no food – no us. But dirt gets little respect. Until our language loosened up in the 1960s, “dirty” was the 4-letter modifier of choice: dirty liar, dirty rat, dirty dog, dirty deed. Today the word seems quite mild, even quaint, but there is still a huge phobia of dirt. Dirt – the kind you dig in – is nothing more than decayed organic matter. Leaves fall in autumn, and by the next year they have been miraculously transformed into a rich soil in which the tree’s seeds can germinate and grow. All kinds of organic material can decompose into soil, including food scraps and paper. By composting, organic waste becomes dirt; what is useless becomes useful. As the saying goes, one person’s trash is another’s treasure. In part because the compost product can be sold, having food waste removed separately for composting is less expensive than including it in our usual waste stream. At CHW estimate we will save several thousand dollars annually. Americans generate an estimated 133 billion pounds of food waste easy year. (No, that’s not a typo.) This is almost 1/3 of all the food produced. Composting can have an enormous positive impact not only on our environment, but ultimately on our health. So far with our trial we are on track to compost over 10 tons of food waste per year. Undoubtedly some people will be a bit squeamish about something as dirty-sounding as composting. But think about it: how much worse is your uneaten pizza crust or unpopped corn kernels in a separate bin than mixed in with everything else? I’ve been composting at home for decades and if anything, it’s tidier than having unsorted trash. 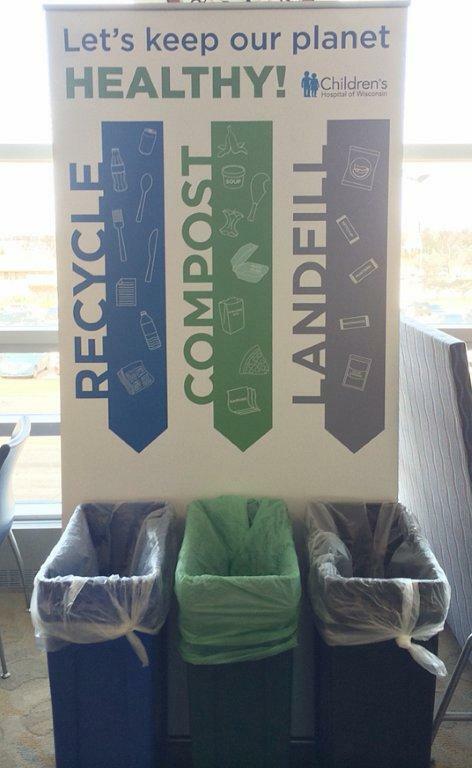 So when you see the new compost bins and signs, go ahead and pitch in! We’re starting in one area to get out the kinks, with hopes to eventually expand to all of our food service areas. It’s better for the earth, better for Children’s, and ultimately better for children. As Alice would say, go ahead and create some love. The prevalence of asthma in the US, which doubled from 1980 to 1995 and continued to increase, with widening racial disparities, has flattened, and the racial difference stopped growing. Moreover, this is being driven primarily by a plateau in the rate of asthma among black children. The lasting consequences of adverse childhood events – ranging from poverty to violence to family instability – are increasingly recognized, but little is known about how to mitigate the effects. An intervention among poor minority middle school youth in Baltimore schools demonstrated that mindfulness-based stress reduction techniques led to significant improvements in psychological and behavioral outcomes: less depression, somatization, negative coping, and post-traumatic stress symptoms. There’s still a lot of work to do to erase the pervasive disparities in our community, but it’s great to get some encouraging news from time to time. You are currently browsing the Starting With Curious blog archives for March, 2016.